Overview - A stifled teen finds his voice with encouragement from the manager of a local water park, where he takes a summer job to escape his unbearable home life with his mom and her overbearing boyfriend. There are very few things in this world as painful, embarrassing, and utterly confusing as the sheer awkwardness of adolescence. Likewise, there are also very few things as relatable, humorous, nostalgic, and ultimately life-affirming. Through the memories of our own mutual humiliation and requisite growing pains, comes a kind of universal kinship and understanding, helping to make teenage coming-of-age stories so irresistibly appealing. Hollywood is home to a long line of such flicks, and with 'The Way Way Back,' writer/directors Nat Faxon and Jim Rash offer a rather inspired and wonderfully enjoyable new addition to the pack. Heart-warming, funny, and lovingly cringe-worthy at the same time, this is a sweet and effortlessly entertaining little film that is guaranteed to bring back memories -- both joyful and mortifying. Duncan (Liam James), a shy fourteen year old boy, is forced to tag along with his Mother (Toni Colette) and her arrogant boyfriend Trent (Steve Carell) when they head off to a beach house for the summer. At first, the awkward teenager has trouble fitting in, but he eventually befriends a sarcastic and carefree adult, Owen (Sam Rockwell), who works at a local water park. When he offers Duncan a summer job, the meek adolescent starts to come out of his shell and finds new confidence. But as the pressures of his home life take a tumultuous turn, Duncan's newfound happiness is put in jeopardy. Serving as a kind of throwback to classic 80s coming-of-age films and teen summer flicks, the movie has a fun old school sensibility and an amusing air of nostalgia. While this does admittedly make the script feel a bit too familiar at times, the filmmakers inject enough of their own unique personality into the proceedings to make it all seem fresh. Culling from several of their own past experiences, the writers fuel sharp comedy and affecting drama through childhood embarrassment, trauma, and even a bit of triumph. At its best, the movie's blend of relatable humiliation and teenage insight starts to evoke the likes of Paul Feig and Judd Apatow's wonderful series 'Freaks and Geeks,' and there's a genuine sense of authenticity to the humor and conflicts, especially when the line between the two starts to blur -- including during one of the most tense games of Candy Land to ever hit the screen. With that said, in a few instances the comedy does occasionally veer toward a slightly cartoonish tone. This is particularly true of some of the water park bits, and while these silly antics are staples of the genre, they actually feel a little out of place here. The writers lovingly adhere to certain comparatively broad clichés, clearly demonstrating great admiration for previous flicks of this type, but in many ways the film might have actually been better off distancing itself a little more from what came before. Similarly, Duncan's early journey toward confidence comes across as a bit too easy and lighthearted, and just a few more obstacles and setbacks would have helped give the movie a little more bite and realism. Thankfully, actor Liam James has absolutely no trouble selling his character's frequent embarrassment and timid cluelessness. In fact, most of the time he really doesn't even look like he's acting, and instead the young performer simply comes across as a totally natural and utterly awkward teenager, fully conveying Duncan's "deer in headlights" insecurity and youthful frustrations. The part could have easily come across as too affected or low key, but James totally nails it making it easy to root for him. Sam Rockwell is also fantastic as the hilarious slacker water park manager who helps Duncan find his way. His effortless charisma is endearing and the friendship that forms between the stunted adult and his young protégé is heartfelt and amusing. The rest of the ensemble is great as well, with fun turns from Allison Janney, Rob Corddry, Maya Rudolph, Toni Collette, and Anna Sophia Robb as every teenager's ideal dream girl next door. Of course, special mention must really go to Steve Carell. The usually instantly likeable actor has to play against type here, and Carell does a fantastic job of portraying a real jerk. Hell, he's actually so good that I'm starting to think that his nice guy persona might be the real act. 'The Way Way Back' doesn't break any new ground, but its funny and touching story hits all the right comedic and emotional beats. The cast is wonderful, and writer/directors Jim Rash and Nat Faxon do a great job of tapping into the universally relatable joys and struggles of youth. Yes, the script does feel a little too familiar, predictable, and occasionally broad at times, but the filmmakers and ensemble still manage to create a unique voice all their own. An entertaining love letter to old school coming-of-age flicks, the movie is a sweet and witty celebration of adolescence, friendship, family, and water slides -- all the perfect ingredients for any great summer. 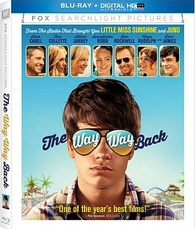 20th Century Fox presents 'The Way Way Back' in a Blu-ray/UltraViolet combo pack. A single BD-50 disc comes housed in a keepcase with a cardboard slipcover along with instructions for a digital copy. After some skippable trailers the screen transitions to a standard menu. The packaging indicates that the release is Region A compatible. The film is presented in a 1080p AVC/MPEG-4 transfer in the 1.85:1 aspect ratio. Highly detailed, bright, and vivid, this is a fantastic looking picture. Shot on the Arri Alexa, the digital source is clean and essentially artifact free. I did notice some minor shimmering in motion and some light noise during a few shots, but these issues are very negligible. The image carries razor sharp clarity, rendering a great sense of fine detail and life-like dimension, fully bringing the beach house and water park locations to life. The color palette adheres to a faintly pastel look, but the picture remains bright and vibrant with very pleasing saturation. Greens and blues are particularly striking, and Allison Janney's extreme tan also manages to offer some amusing pop. Contrast is high and while whites can look just a tad blown out, blacks are solid throughout. With a crisp, sharp, and colorful image, 'The Way Way Back' hits Blu-ray in style, and thankfully avoids any major technical hiccups. The movie is provided with an English DTS-HD MA 5.1 track, a Spanish Dolby Digital 5.1 track, and a French DTS 5.1 track. Optional English SDH, French, and Spanish subtitles are also included. Though a little frontloaded at times, this is a fun and well balanced track that brings a great sense of atmosphere and spirit to the proceedings. Dialogue is clear, full, and well prioritized throughout with no issues to speak of. Effects work features strong directionality and smooth imaging between speakers, spreading ambient beach location sounds like crickets, gulls, sea breeze, and waves naturally around the room. Likewise, the film's water park setting is appropriately lively, though surround activity can be a little sparse. Music carries great separation and range, giving the film's enjoyable soundtrack ample presence. Balance between all of the audio elements is also handled well, and low frequencies kick in nicely during certain songs and effects. Though relatively modest, the mix has a welcome sense of space and personality giving the film some solid aural texture without overpowering the story with gimmicky effects. Fox has put together a solid collection of supplements, including some interesting behind-the-scenes featurettes. All of the extras are presented in 1080p with Dolby Digital 2.0 audio and the same subtitle options as the main feature, unless noted otherwise. Deleted Scenes (HD, 3 min) - Three deleted scenes are viewable separately or together. These aren't too substantial but we do get more craziness from Allison Janney's character and some drunken singing from Maya Rudolph. Theatrical Behind the Scenes (HD) - In this section we get three featurettes viewable separately: Tour of the Water Park (3 min), The Filmmakers: Jim and Nat (3 min), and Ensemble Featurette (5 min). There are a few worthwhile bits about the water park location, the writer/directors, and the cast, but a lot of the same info and clips are repeated in more detail on the disc's other, more comprehensive featurette (detailed in the HD Bonus Content section). Theatrical Trailer (SD, 2 min) - The film's trailer is included with Dolby Digital 5.1 audio. 'The Way Way Back' is a genuinely sweet and funny coming-of-age flick. Though the script is a little familiar and predictable, the cast is wonderful and the easily relatable story is full of heart and humor. The disc features fantastic video and a strong audio mix. While not packed with extras, the featurettes thankfully offer more than your usual studio fluff. Nostalgic, emotional, and witty, this is a feel good film that fully earns all of its crowd pleasing charm. Recommended.